I previously covered a VBA solution for a problem that could have been solved using array formulas. 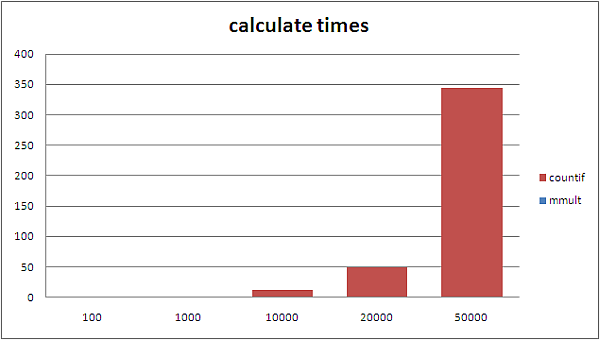 In our example, through Optimizing the array formula we have reduced the calaculation times by a factor of 10 for a medium sized (50,000 * 30) test data sample. 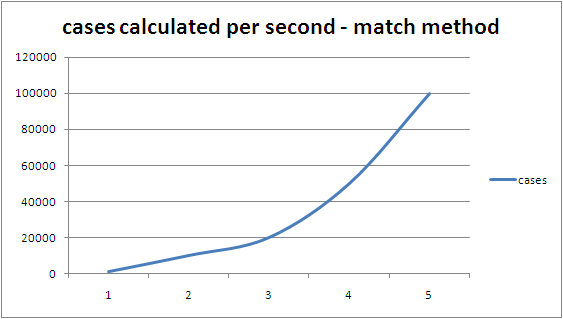 Although this sounds like a good result, it's not good enough - since workbook calculation still takes 5 minutes, and run times are exponential rather than linear. So we need to find a way to get this down to under a second, and at the same time get to a predictable run time for bigger data sets. Here are the current calculation results using countifs for the cell call calculations. The problem here is that the bigger the data set, the more countifs has to search multiple times - so how to get a small, predictable cut of the data for each search. 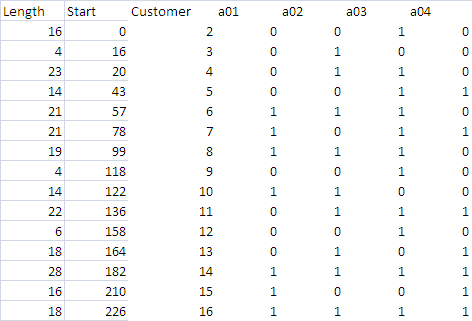 This is saying that we need to do an exact match on the customer number in cell C3, but we only need to look at the small strip of the input data that starts after the section belonging to the previous customer is finished. In this case we are going to count from the place that this customer's section starts to the place when the data doesn't belong to this customer any more ($c3+1). Although most people use 0 as the 3rd parameter to MATCH(), the default behavior is to stop when we match >= $c3+1. How to replace the countifs functionality with MATCH. 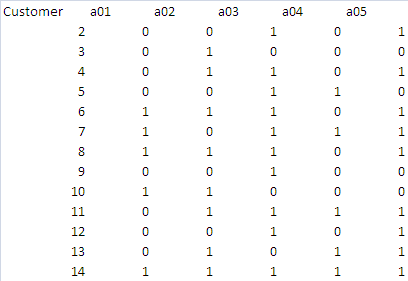 This is checking the section of the input data used by this customer and defined by columns A & B, to see whether there is a match with the product associated with this column, and converting the true/false returned by isnumber() to 1/0. Again, this can be filled across an down for the whole table body. We could just leave it at that, but a big data set like would be error prone to setup manually as well as taking a lot of time, so using some of the VBA approach used in Array formulas and large ranges, this is pretty straightforward to automate. and to populate the workbook with the formulae discussed earlier. SAd(listCustomer, helperStart), 0) & ")-1"
SAd(helperStart, helperStart, True, True) & "-1"
0, cop.Count + 1, 1) & ")") & ",)-1"
Why not join our forum, follow the blog or follow me on twitter to ensure you get updates when they are available. You can also submit anything you want considered for publication on this site to our forum.